Last month, GR+ headed to Vancouver ahead of the release of FIFA 17 to pick the brains of creators EA Canada – a trip which resulted in our guide to Ultimate Team, based specifically on the advice the developers gave us. But now the game’s out and I’m approaching the 80-hour mark I’ve found that there’s one source of tips and tricks even better then the developers, or other gaming websites. That source is… you. So GR+ is serving up something it's never done before. An entire tips and tricks feature based around the very best advice given by dedicated users of the official FIFA Forums, Reddit, Operation Sports and more. FIFA is a colossal beast so it’s impossible to cover everything, but these are the golden nuggets which have stood out and aided myself, and other FIFA players on the GR+ team. Got one you think outdoes all of the below? Hit me on Twitter @BenjiWilson and I’ll consider adding it to the shortlist. One of FIFA 17’s main issues is lack of variety, with the computer able to ping-pong pass at will on upper difficulty levels. You can amend that by using the in-game slider system to tweak every element of the match engine. (Go to Customise > Settings > Game Settings > User Gameplay Customisation. Matt10 from Operation Sports is the guru of this stuff, and his recommended slider set is below. For further details, be sure to read his in-depth explanation of what each slider affects. Set back line to: offside trap. When the game starts, you need to set the right D-pad to ultra attack (one less than all out attack). Also set team pressing from the D-pad up menu. (Do not set high pressure from the d-pad down menu as it'll overwrite the custom tactic, and you'd have to pause the game to select it again). On top of this, you must have auto-player change enabled, where the CPU picks the nearest player to the ball for you. This becomes unbearable when all they have to do is hold RB for team pressing. Using the right analogue to change player manually also further helps in high pressing the opponent. TOTW cards – that’s Team Of The Week – are among the most highly sought in Ultimate Team, so naturally every Ivor Impatient wants them as soon as they’re released into the market each Wednesday. Don’t be an Ivor. (Unless you are actually called Ivor, in which case crack on.) Instead, bide your time until day one premium prices drop. Over to Murrdog559 on Reddit: "TOTW prices start going down hard on Saturday, and then after FUT Champions [FIFA's new weekend league] finished on Sunday they hit rock bottom.” Succinct and to the point, but it’s advice that’s served me well. Heed it. In addition to winning matches and leagues, you can make fast bucks in Ultimate Team by working the market like a digital ‘appy ‘Arry. But many find the prospect of doing so intimidating. Over to Reddit user KavMaaan, whose techniques mirror mine almost exactly. I have 7-8 players who I shop for at a certain price and then immediately relist for a 30% Buy Now mark-up. That alone easily generates upwards of 2,000 coins per day. If I didn't have a job, I'd be into five figures in an afternoon. Distressingly, Ultimate Team coins don't pay mortgages. "The truth is, you can buy ANY player low and sell him high," writes KevMaaan. There's no secret player or special card that makes fast cash. I have chosen about 12 players at the mo, and I've learned their price. I "mass bid" them and aim to win about 60% of the auctions I bid. On most of my purchases, I only make say 100-300 coins. If I win 10 items, I've made 3k. It's that easy." 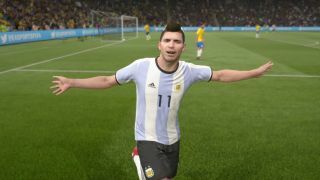 I pride myself on being a FIFA expert, but had no idea there were 109 different goal celebrations in the game. Nor that Antoine Griezmann of Atletico Madrid and France has his customary ‘Hotline Bling’ move included – and no other player in the game can do it. Hence, Reddit user Maniiia’s PDF guide to every celebration is an essential download. You might even consider laminating it, it’s so important.